Icelandair offers the best combination of value, comfort, and stress-free travel between North America and Europe. After online check-in, baggage drop was fast with no waiting in-line. Lounge at YVR, shared with other airlines such as Air France, was decent, with good food offering. Boarding was fast and relaxed, and the aircraft actually departed earlier. Seats in Saga Class are not flat bed, but they are comfortable enough for a 7-hour flight to Keflavik, and certainly a good value for the Saga Class price point that is much lower than other carriers. Seating configuration on the Boeing 757 is 2-2. Crew, as usual, was attentive, but discreet and dignified. Meal was consistent with business class meals on other carriers. Entertainment system was superior to that of British Airways, with Icelandair offering internet access at no charge in Saga Class throughout the flight. Icelandair main meal on YVR-KEF flight segment. 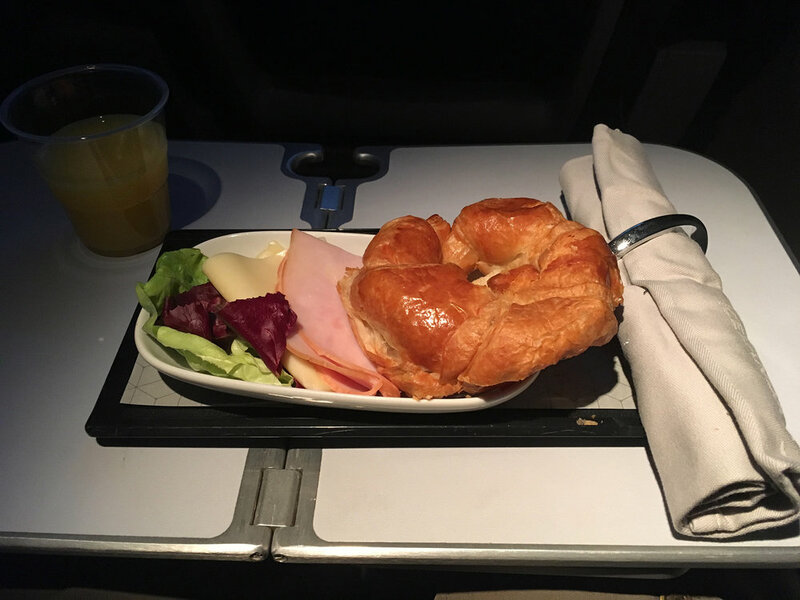 Icelandair snack/breakfast on YVR-KEF flight segment. Arrival at Keflavik was on time. However, no gate was available, probably due to rapid growth of air operations in Iceland, requiring a bus ride to the terminal. Same situation for the connecting flight to Copenhagen. This was the only somewhat low point of the journey, as it is always better to unboard an aircraft at a gate directly, without having to be stuck in a bus with the entire aircraft. The new Icelandair Saga Lounge is well designed, with a pleasant and relaxing atmosphere reminiscent of Iceland. Food offering were excellent, and the ability to get a shower before the next flight is always a nice perk. Connecting flight to Copenhagen was uneventful. The seating configuration on the Icelandair Boeing 767 is 2-1-2 in Saga Class. Breakfast was better than offerings on most European carriers. Icelandair breakfast on KEF-CPH flight segment. A few more details on this trip are noteworthy. First, Icelandair allows for seat selection at the time of reservation with no additional charge. In contrast, British Airways charges $120 to select a seat in... Club World. Additionally, a change was required at some point on the reservation. For some reasons, the reservation could not be changed online, and upon calling Icelandair in Reykjavík, I was advised that there were over 50 calls ahead of me (as a result of flight disruptions due to bad weather). Rather than waiting on the phone, I sent an email to Icelandair, which, surprisingly, was promptly addressed. Overall, and this may surprise some people, flying with Icelandair is just stress-free and relaxing, and actually a more pleasant experience than flying on British Airways in First Class. Icelandair therefore remains NORSKK's carrier of choice for travel between Europe and North America.